Empa, the Swiss Federal Laboratories for Materials Science and Technology, opened a demonstration facility in Dübendorf under the name of ‘move’ in 2016 to show ways of switching mobility to renewable energy. Now, after two years of practical tests, the first project phase centred on hydrogen fuel has been successfully completed and a gas conversion phase is beginning. The first phase involved setting up a plant for the production and refuelling of hydrogen and testing in vehicles. 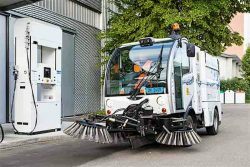 Empa used a hydrogen-powered road sweeper, which was developed in conjunction with the Paul Scherrer Institute and Bucher Municipal and utilized by the Dübendorf Roads Authority for the daily street-cleaning. 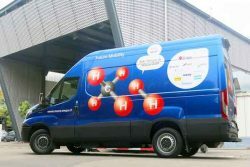 To analyze a hydrogen and biogas mixture, a delivery van powered by it was used for the parcel service. This mobility path came about in collaboration with the Swiss gas industry, Iveco and Swiss Post. With the pump supplier Linde, a refined hydrogen sensor is also being tested at the “move” refueling station, and a calibration process for hydrogen refueling stations is being developed in conjunction with the Federal Institute of Metrology (METAS) as part of an EU project. As a result, Empa’s hydrogen refueling station is one of the first calibration refueling stations in Europe. Thanks to experience gathered within the scope of authorizing the refueling station and the development of safety concepts, a lot of data and many models for the propagation of these technologies are on hand today. The second round of ‘move’ is focused on the conversion of hydrogen and CO 2 into synthetic methane for the operation of gas vehicles. Switzerland harvests much more green electricity than it can consume. The Empa concept prevents the shutdown of solar and wind power systems at times when they are particularly productive. ‘Move’ shows how temporary excess electricity can be used to generate hydrogen. The hydrogen is compressed and can be used via a hydrogen filling station either directly in fuel cell vehicles or as an admixture to biogas in gas vehicles. The advantage: synthetically produced methane can be stored in the existing natural gas network; it does not need a new (and expensive) infrastructure to drive an environmentally friendly car. ‘move’ is an Empa research and technology transfer platform, which is co-financed by the Swiss Federal Energy Agency (BFE). It demonstrates the technical possibilities for climate-friendly, post-fossil-fuel and sustainable mobility in an exemplary way. The priority is to switch from fossil fuels to renewable energy. For this purpose, the primary area of research is the use of electric, hydrogen-powered and gas-powered vehicles in practice, including investigation of energy provision and storage, and the ways in which the energy system is influenced by energy consumption.